A changing climate means a changing society. The Island Press Urban Resilience Project, supported by the Kresge Foundation and the JPB Foundation, is committed to a greener, fairer future for all.​ This post was originally published on Truth-Out.org. In December, world leaders will meet in Paris for the UN Climate Conference (COP21). Some say the fate of our planet depends on the outcome. For local activists working on climate change, that's a chilling thought (even in a time of record breaking heat). The fact is, world leaders are not likely to deliver the changes that frontline communities need to prevent - and survive - the climate crisis. That's why we need to take action on our own, in our communities. In the best-case scenario, the Paris conference will produce an international agreement that regulates global CO2 emissions. It may even provide scant resources for infrastructure and other improvements in "developing" countries. But no one expects that agreement to transform political and economic systems - and power dynamics - that cause climate change to have a disproportionate impact on poor and working class people. 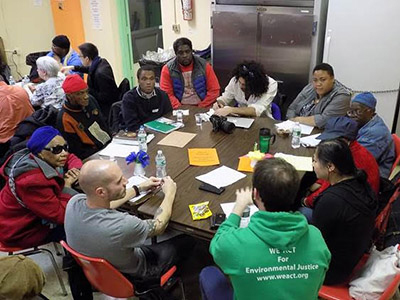 To provide an alternative vision for climate policy, WE ACT for Environmental Justice has partnered with local residents to create the Northern Manhattan ClimateAction Plan (NMCA), which emphasizes political and economic democracy as a means of achieving climate justice. By putting communities in charge of energy infrastructure, communications, governance and other key systems, advocates for justice can mesh climate change actions with efforts to eliminate poverty and build community. In this sense, the NMCA seeks to protect people - not just places and profits. 1. Energy Democracy: Commonly owned and managed green energy infrastructure - such as cooperatively owned microgrids - can create more resilient energy systems, while providing much-needed capital for low-income residents. Tenant organizations and property owners can use shared space to house energy infrastructure and develop co-management systems that meet residents' needs. 2. Emergency Preparedness: Hurricanes Katrina and Sandy showed our lack of preparedness for severe weather events. To prepare for the next storm, we must revise design guidelines and other urban development policies to harden our infrastructure. At the same time, we must build new transportation systems, public spaces, urban gardens and other features that can reduce carbon emissions, address the urban heat island effect and create gathering spaces for democratic activity. 3. Social Hubs: To do this work, we need space. By building a network of temporary, semi-permanent and permanent spaces that can host meetings, store equipment/supplies and even incubate cooperatively owned enterprises - such as a restaurant, media production facility and/or food coop - community members will have centralized hubs to build social networks and produce/store physical resources. 4. Participatory Governance: To transform political and economic systems, we need to increase democratic participation. That means upping voter turnout, building partnerships with progressive legislators, educating constituents on political processes/theories, taking direct action and implementing proposals for public policies, developments, etc. At the same time, we must build systems of decision making that are open to all, regardless of class, race, gender, language, etc. The four steps listed above seek to shift power dynamics so that local communities can play a greater role in producing their economy and built environment, while creating a new commons, in which life and equity are valued more than accumulating money and power. Here in New York City, even in the De Blasio era, socio-economic inequality remains above the national average. But we have an opportunity to actually do something about it. The City government has set a goal of reducing CO2 emissions by 80 percent by 2050. That will require a substantial investment, which some have put at more than $5 billion per year between now and 2050 - enough to create over 80,000 jobs annually. Depending on City policy, those employment opportunities and investments could go to dispossessed communities, which tend to be in the most geographically vulnerable areas, or they could wind up in the pockets of executives and corrupt politicians. The stakes are high. The NMCA offers a blueprint for investments and social structures that would foster greater democracy. But, ultimately, we need deeper participation from residents to successfully confront power. We hope this plan is a meaningful step toward a future in which the power over our environment is in our hands. Aurash Khawarzad is an urban planner working and living in New York City. His practice is focused on the democratization of urban development. He currently works as a Policy Coordinator at We Act for Environmental Justice and as a Lecturer on urban planning at The New School. Recent projects include the Northern Manhattan Climate Action Plan, Waycount, a tool for community-based transportation planning, and the redevelopment of the 135th Street Marine Waste Transfer Station, among others.